Please use the pull down menus to access the hikes and other features. For all hikes please look under CATEGORY to the right for a specific location to hike. FEB 2019 TO SPRING 2020 – A SECTION OF THE NORTH SOUTH TRAIL IS BEING DETOURED DUE TO CONSTRUCTION OF THE TRESTLE TRAIL BIKE PATH. SEE LEG 6 OF THE NORTH SOUTH TRAIL FOR MORE INFO. TRAILS AND WALKS IN RHODE ISLAND is teaming up with the BLACKSTONE HERITAGE CORRIDOR/NATIONAL PARK SERVICE and THE RHODE ISLAND LAND TRUST COUNCIL again in 2019 for a series of hikes. Click here to see the schedule. 9/8/18 – Hunting season is here again (September 8, 2018 – February 28, 2019 & April 20, 2019 – May 31, 2019). Be sure to wear orange in areas where hunting is allowed. AUG. 2018 TO SPRING 2020 – TRESTLE TRAIL “WEST” TEMPORARILY CLOSED. This will impact the Trestle Trail West, Spencer Rock, and North South Trail hikes. …is the smallest of the States but offers a wide array of places to hike, walk, or bike. Rhode Island also has some tremendously beautiful sites whether it be by the ocean, in the rolling hills, or in the middle of the city. Providence, Newport, and Block Island are the primary tourist destinations in Rhode Island. Providence offers a rich history and some spectacular architecture. It is a very walk friendly city. From the downtown area one could walk one or all of the walks. Newport, thirty five miles to the south, is a seaport city at the entrance of Narragansett Bay. It is also a very walk friendly city. 14 miles south of the mainland is Block Island. This summer tourist attraction offers about 25 miles of trails. Block Island is unique being that over 40% of the island has been permanently conserved. In the middle of Narragansett Bay is Prudence Island. The island is nearly 85 % conserved and offers several miles of hiking. If you plan on hiking on Prudence Island, be known that the island is not commercialized. There are no restaurants, lodging, or transportation services. There are no public restrooms on the island except a composting toilet by the T-Wharf at the southern end of the island, which is several miles from most hikes. Once you are off the ferry you are on your own. Bring everything you will need for a day hike with no services. Furthermore, ticks are in abundance on the island. It is necessary to take precautions including proper clothing, sprays, and frequent checks. Rhode Island is also home to some of the best beaches along the East Coast. Although only 37 miles wide and 48 miles long, the state has over 400 miles of coast. The south facing Atlantic beaches are haven in the summer months. Rhode Island also has one of the largest bays on the east coast. Narragansett Bay stretches from the ocean to the capital city of Providence. There are several places to access the shores of the bay for views of the water. Rhode Island has no mountains, in fact the highest point in only 812 feet above sea level. There are however several hikes that offer scenic views at lookouts. Furthermore, Rhode Island has several small rivers and streams. In the industrial days of mills many dams were built. There are also some natural waterfalls. Many of these waterfalls and dams are accessible via hiking trails. For the bicyclists, Rhode Island offers several bike paths, including several rails to trails, totaling nearly 60 miles. 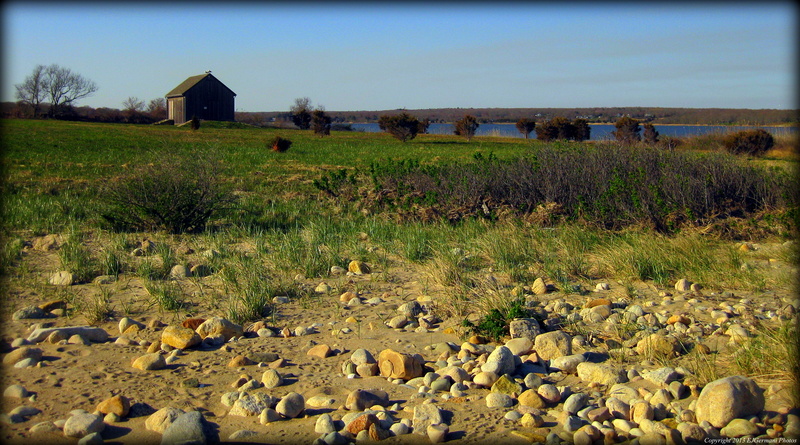 Rhode Island is also home to five National Wildlife Refuges. They are all in the southern end of the state (including Block Island) and some have trails open to the public. They all offer views of the ocean or salt ponds. The northern end of the state falls within the Blackstone River Valley National Historic Park. There are several hikes available within its boundaries. Furthermore, in the East Bay area is the (currently proposed) Sowams Heritage District. 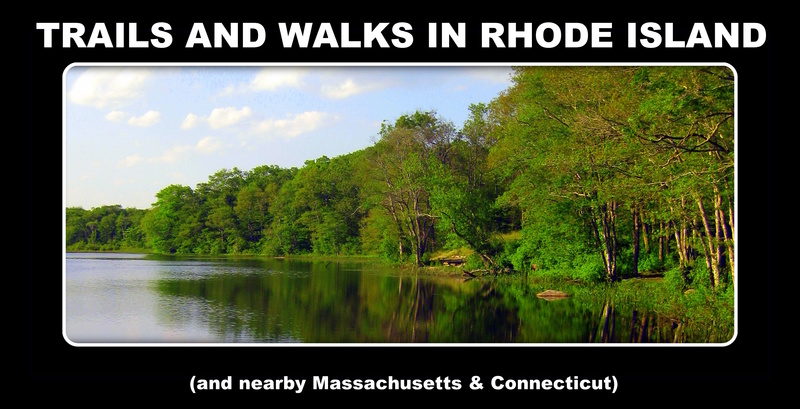 The crown jewel in Rhode Island for hiking are the State Management Areas. There are hundreds of miles of trails within these areas. The Nature Conservancy and Rhode Island Audubon Society own several properties that have hiking trails. Some of these properties are the best known and most used. If you are looking for a long distance hike, Rhode Island has the 78 mile North South Trail that passes through several State Management Areas as it traverses through nine towns. Many of the properties that the North South Trail passes through can be hiked individually. For those of you looking walking paths, Rhode Island has plenty of small parks in its cities and towns. These spots are good for beginners, general exercise, and/or strollers. I’ve also included hikes and walks that are in nearby Massachusetts and Connecticut. The towns I’ve choose to include in these states are the ones that directly border Rhode Island and the ones that are in the easily accessible via the highway corridors of Interstate 95, Interstate 195, and Route 146. I’ve researched many books and websites to compile an ever-growing list of nearly 500 walks and I have been adding them to the blog site as I complete them. I hope you find these blogs useful. I’ve included nature hikes, beach walks, urban walks, city parks, state parks, and bike paths as well, varying in lengths of less than a mile to over 10 miles. Distances are measured by using phone apps such as Alltrails, EveryTrail, and Map My Hike and are approximate only. With each blog entry I have added links to trail maps (when available) and photos that I have taken on the hikes. I’ve also added coordinates for the trail-heads or parking areas with a link for directions and I give a short description of the hike that I took. Please note that the descriptions that I have blogged are the routes that I have chosen. I have used many sources for maps and trail descriptions prior to hiking most sites. The maps that I have linked do not always show the trails that I have used and should be used with caution and at your own risk. I have listed all of my sources below. Also note that several sites are open to hunting. I do try to note this in the blogs. Be sure to check if the site you plan on hiking is in fact a hunting area and be sure to follow the rules of the hunting regulations which I also listed below. Hiking in Rhode Island, as with anywhere else in the world, does present its fair share of hazards that you should be aware of. In Rhode Island, hunting season starts in mid September and continues well into the spring. Hunting is allowed in all state management areas and several Nature Conservancy and local Land Trust properties throughout the state. Wearing the proper attire while hiking is not only suggested, but mandatory in these areas. Please click the link below for more information. Please note sections 10.6 and 11.6 of the RI hunting regulation on requiring the use of orange vests and hats on State management properties and other properties where hunting is allowed. 10.6 All users of State Management Areas and undeveloped State Parks are required to wear solid daylight fluorescent orange during appropriate seasons. 11.6.5 Five hundred (500) square inches by all hunters and other users (including archers) during shotgun deer seasons. 11.6.8 All other users of State Management areas and designated undeveloped State Parks, including but not limited to: hikers, bikers, and horseback riders, are required to wear two hundred (200) square inches of solid daylight fluorescent orange from the second Saturday in September to the last day of February, and the third Saturday in April to the last day in May, annually. In recent years the wildlife population has been making a resurrection in Rhode Island. Animals like bears, mountain lions, and bob cats have been reported throughout the state. Coyotes and foxes have been common as well. Most wild animals are harmless to hikers in Rhode Island. They are in fact just afraid of you as you are of them. However, an animal protecting its young or food source may become aggressive. The animal may also become aggressive if it is rabid or feels cornered. It is best to avoid wild animals altogether when hiking. Insects can also pose a threat to hikers. Ticks carry Lyme disease and ticks are very common in Rhode Island. Be sure to check yourself (and your pets) thoroughly after any hike. In the late summer into the fall mosquitoes can carry diseases as well. West Nile Virus and EEE are the two most prevalent diseases that mosquitoes in this area carry. Avoid hiking near dusk when the threat of these diseases have been confirmed in mosquitoes. Bug spray is suggested for both ticks and mosquitoes. Leaves of Three, Let Them Be… another hazard in the area is poison ivy and poison oak. These annoying plants will leave you scratching if you come in contact with them. The best way to avoid it is to stay on the trails and avoid touching plants. New England is also quite famous for its weather. One day it could be 60 degrees and the next could be snowing. Spring tends to be damp with rain and showers occasionally. The trails in areas will tend to be muddy. Summers have been hot and dry as of late. An occasional thunderstorm will disrupt an afternoon hike. Fall makes New England famous. The leaves turn bright reds and oranges in mid October into early November making for some unbelievably beautiful hiking. Winter varies from year to year. Some winters have been very mild with only a few snow storms and others have been relentless with northeasters and blizzards. Snowshoes are sometimes required in the winter months. Be sure to always check the weather before departing into the woods. The Sakonnet Greenway Along A Field. Great Swamp Press has published a series of maps for some of the Wildlife Management Areas in Rhode Island and nearby Connecticut. They include the Arcadia Wildlife Management Area, Carolina & Burlingame Wildlife Management Areas, Big River Management Area, & Pachaug State Forest. It is advisable to carry a copy of these maps if you are not overly familiar with the trails in these areas. Several local stores sell these maps. Audubon Society of Rhode Island, Mass Audubon, The Nature Conservancy, The Trustees Of Reservations – Massachusetts, The Rhode Island Department of Environmental Management, The Rhode Island Department of Transportation, The Massachusetts Department Of Conservation & Recreation, The Rhode Island Land Trust Council and ExploreRI.org, various municipal land trust sites, as well as many Facebook community pages including Hiking in Rhode Island, and other blogs including the very useful Auntie Beak’s Hike Finder. Thank you friends, family, and groups who I have walked and hiked with. Send a message via Facebook! Jen McCaffery, Sarah Mead, and the rest of the crew at Rhode Island Monthly Magazine for voting Trails and Walks in Rhode Island as the Best Hiking Website – 2014.
very excited to find this! i am working on a similar project. see http://auntiebeak.com/Aunties-Hike-Finder.html. we should tawk….! Great and very informative list! Thanks for the link! Great job! I want to go this weekend! So sorry to hear about your injury. I have only recently found your site and I think it’s a spectacular resource. I hope you heal up well and quickly! I have been looking for a photo of Slater Park duck pond and yours is great. Can you contact me about seeing how I can get a copy of one of them? I have googled EJGermani photos but can not find you. Thanks! Marc feel free to copy it from the blog, all i ask is that you don’t use it for profit. can you send me the jpeg file? It is just to hang in my family room as a great memory of where I grew up. If I have the jpeg, I can have it printed by a photo place to fit a frame that I have. My email is tessier@aavid.com. Thanks a whole lot! Thanks EG, Copicut was lovely. Easy to navigate as you said. AAA Southern New England will be mentioning the Turner Reservoir in the My Town column in the May issue of our club publication Horizons. This goes out to about 1.7 million member, and there is also a web version and now a Facebook page. I would like permission to possibly use one of your photos in these venues, such as the panorama of the reservoir or the waking trails. We would of course give a photo credit. Great work on the site!! I’m glad I found this resource. Kudos E, a job well done. Quite an honor. Thank you for following and thank you for the information. I will make a note of Atlantic White Cedar Swamp. I was actually planning on heading back into Lime Rock in the next few weeks. I will check it out. Thank you again for the info!! Hi, i went on a couple great hikes today that I found via your blog, Mowry and Connors Farm. I tried to find Cascade Brook…even parked at the end of the road like you did, at the orchard. Walked around the area but didn’t see any signs or blue marks for the trail. Is the trail at the orchard or down the road some? Thanks for any info…any pics that would help? oh…nevermind 🙂 I just realized I was on Maplewood Orchard rd, not Mapleville Rd! I was so close….Ill try again next weekend. This is an amazing resource; thank you so much! Amazing resource. There is also a short (.05 mile?) paved trail in Killingly, CT called Cat Hollow you might enjoy. It goes along a pond/ stream and has a beautiful waterfall at the end. Great resource! As for the Carr Pond area, I have memories of going there is a kid. Many of the vacant buildings and structures are remains of an old Girl Scout camp that closed in the past 10’years or so. I have recently retired and enjoy hiking. I have Ken Weber’s Weekend Walks book and your extremely informative blog as guides. Together, they have provided some wonderful outdoor entertainment. Thanks so much for the info. You have been very busy! I think I am all caught up now. Beautiful photos of a gorgeous state. You will know Rhode Island inside and out! Great job! This a great site . It s the first time I have come across it .Please contact me when you have a chance . The Rhode Island Hiking Club is my club and I love nothing better then promoting local hikes . Thank you Tony!! I will send you message via Meetup when I log on next. Hi, I noticed that you’ve walked through Glocester and the Durfee Hill Management area. I do a little prospecting, and I read that there was a gold mine up there back in the 1870’s, and I was wondering if you had seen anything indicating its presence. I have not… I was not aware of anything of such. If you are on Facebook, you may want to look up/contact the Rhode Island Ruins page. The person who runs that page is quite knowledgeable of many former places in Rhode Island. WOW! As a major hiking aficionado (ok, freak! ), who is a 15 yr member of the Sierra Club, grew up in Rumford, RI, and was a hike leader of the SF Hiking Club, leading the killer 24 mile 12,000 ft vertical gain in a day hike, I am impressed! While the hikes back here are not quite as challenging, they contain amazing and beautiful treasures that only this area possesses, and to overlook even the smallest of these gems would be unwise of any hiker. In the right hand column bar you have way too many info choices. Perhaps you could put a little selection option at the top for Archives, Features, Trails, Distance, Municipality. Just thought this might be a helpful piece of feedback, and keep doing an amazing job! Thank you much!! And thank you for the suggestion. I have recently thought about that. I think it is about time to address that issue by adding some menus!! My friend just recommended your site and I am THRILLED!! Thank you sooo much for doing this! Hope to meet you someday on a trail!!! You might want to consider editing your write-up for the Independence Trail in Providence as much of the green lining has been eliminated by the construction of new sidewalks. Best to have your narrative in hand while following the trail. I didn’t & found myself quite bewildered for much of the walk. I see nothing about the North South Trail except where you mention Cliff Vanover’s Book. Since it is the longest Trail in R.I., extending from Blue Shutters Beach in Charlestown to the MA. border in Burrillville (a distance of 78m), I would think it deserves some mention on your web site! First, thank you for all the great information available on your website. It is a fantastic resource. Next, I am writing to ask if you have any information about a trail that supposedly goes all the way around Blue Pond. There is a map posted in the kiosk at the Stubtown Road trailhead for the Narragansett Trail which shows a trail going all the way around Blue Pond. 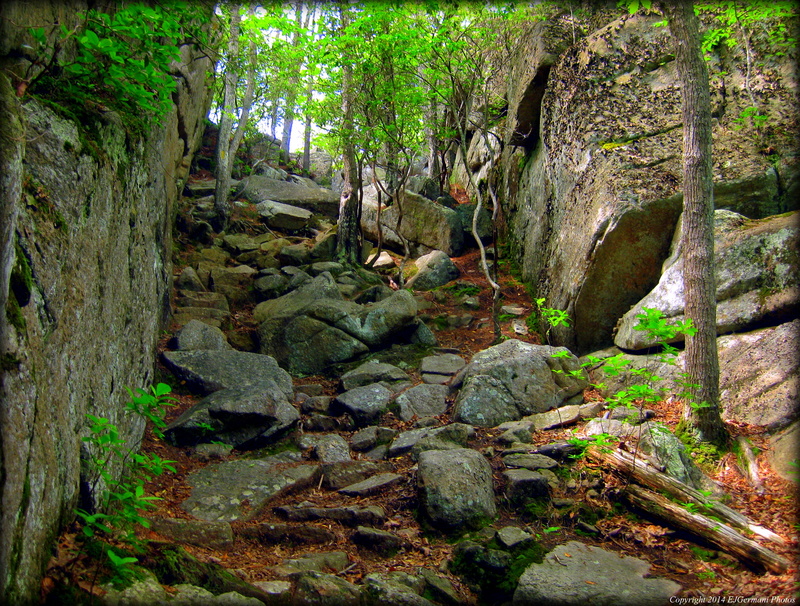 Late last summer, I walked to Blue Pond looking for this trail. I walked past the point where the dam gave way and on up to the place where the Blue Pond Trail/road goes eastward to intersect with the Alton Road. Did not see anything that looked like a developed or blazed trail as shown on the map in the kiosk. I have been unable to find any information online about this trail. Just wondering if you had any info on this trail. I do not have any information on the Blue Pond Loop… Yet! I did see that on the map as well. I may, with a fellow hiker, explore that this coming season to see if there is in fact a new trail. And thank you for following!! Saw the Trails and Walks card on the map box in the parking lot for Francis Carter Preserve this past Saturday — the parking lot located on Kings Factory Road. Did you by any chance walk the River Trail and the Narragansett Loop on Saturday? My wife and I hiked Francis Carter late last fall. At that time, there was a note posted on the kiosk that the Narragansett Loop and River Trail were closed to hiking. When we stopped at the parking lot on Kings Factory Road this past Saturday we didn’t see the notice about trail closures. Also, the River Trail looked as if it had recently been blazed with fresh red paint. Just wondering, are the River Trail and Narragansett Loop now officially open to hiking? Explored the trail on Saturday!! I hiked with you this morning. It was great. I am interested in the hike September 1st and future weekend hikes!!! !